As someone who has spent most my career as research faculty and not in the classroom, I don’t have the depth of formal instructional experience that most of my colleagues in the academy do. My formal “teaching” has largely been in the form of advising graduate students and mentoring graduate students and postdocs in interdisciplinary research projects. So although I am one of the hosts/facilitators I am doubly a n00b in the connected courses sense - new to cMOOCs as well as new to course design. Which means I am thoroughly enjoying taking the plunge as a learner in all of this and muddling through the why of my teaching as I go. I feel very much buoyed by generous ways in which the connected courses participants have responded to the inevitable glitches in facilitating this course, and my thinking aloud in public as we go. This has encouraged me to keep thinking in public, and it feels like the best kind of trust fall exercise for someone who is used to pausing and polishing before sharing. 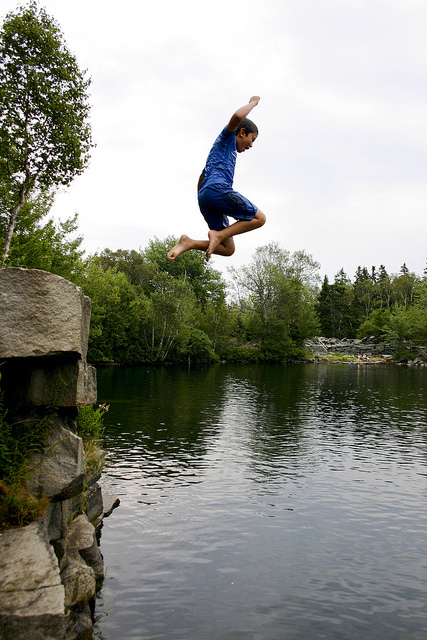 It feels like that productive discomfort before you make a trust fall, or what my kids and I do every summer - jump off a tall ledge in a watering hole. I don’t really want to do it but it’s hella fun when you get enveloped by the cool water after you make that jump. I appreciated Maha describing how she both stays true to her interests and nature but also pushes herself to engage in different ways. Even with different dispositions that pull in different directions, I like that connected courses is pushing us both into productive discomfort and growth. I’m involved in organizing two different connected courses, so my whys for the courses are swirling around for both of them. One is the current course, which I am helping organize and facilitate. The other is the connected course that I am designing together with other DML colleagues. Let me focus on the current course for now… It’s interesting to me that jumping into the stream of connected courses has really brought home to me that there can’t be a singular why for connected courses and there won’t be a singular why for the course we are developing for DML. Given that this connected course is being taught unit by unit with different facilitators, we are all bringing our heterogeneous whys to this experience. When we had our summer camp to start sketching out this course, it was clear that each facilitator brought a different angle and expertise, and we wanted to honor that and give people space to stretch out and develop their own whys. For Fall 2014, our major focus is on running a course for developing and teaching connected courses. The course is designed and taught by faculty from diverse institutions, some of whom are the folks behind successful connected courses such as FemTechNet, ds106, phonar, and the National Writing Project CLMOOC. I’m curious to hear what folks think about this. Crafting whys and mission statements is an interesting and imperfect process. Our goal setting out was to provide a professional development opportunity for faculty who are setting out to teach a connected course. But what all the co-learners in connected courses have taught me from day one is that the why that we may have set out with as instigators of the course is not the why that all participants bring to the course. And this is a feature of a connectivist experience that should be embraced. Clearly the boundaries between facilitators and co-learners are fuzzy since every co-learner is facilitating by participating. So if I take off the organizer hat, as a co-learner my personal why is that I want to experience and learn more about the cMOOC approach. I’ve spent most of my career observing how kids learn through affinity networks on the open web. Connected courses is my first time living through this kind of learning with my own professional community. And I need to immerse myself in this world before we launch our own DML connected course. So as a learner, I guess at least some of my why tracks to the explicit learning goal that we set up as organizers when we started out. As I’ve gotten more steeped in the ethos of connected courses, I have newly emergent whys that tie into my own efforts to support the growing movement for connected learning by building more ties between educational practice and research. I’m starting to geek out on engagement metrics for the course, and thinking through how we can track the cascading effects of an experience like connected courses as it influences educator practice and in turn shapes student experiences. It’s a pretty blunt instrument, but that’s the idea behind the connected courses student survey. How can we better tell a story through research and evidence about why these kinds of connected learning experiences are important? And can we mobilize our networks to tell this story in a way that supports the diverse collectives that are intersecting here? I realize that this research angle is likely not a why that is shared by the majority of participants for ccourses, but I love that there is an emerging research group that is mobilizing on the forum! I’ve noted with interest some of the issues that @mdvfunes and Jenny Mackness have raised on the “tyranny of the open” and the pressures of normative expectations of participation. I particularly appreciated this paper by Ferreday and Hodgson on the “tyranny of participation" which is a great cautionary tale of how the more quiet learners might experience a highly participatory online course. As we are considering risks of various shapes and sizes, from stolen identity to privacy breaches, it seems worthwhile to reflect on these more pervasive kinds of risks or exclusions, silencing and just feeling plain old overwhelmed — all things that were part of my initial foray into connected courses. I like this idea of “heterotopia” that Ferreday and Hodgson suggest as a way of charting a pathway through these dynamics. I think of my emerging whys and the research pod as an example of the heterogeneity of whys that we can continue to support in connected courses. I may be idealistic about this, but I do think it is possible avoid the tyranny of the majority and support and value multiple forms of participation and the varied whys that each co-learner brings to this network. I'd love to hear about the whys that other co-learners are bringing to their connected course experience!